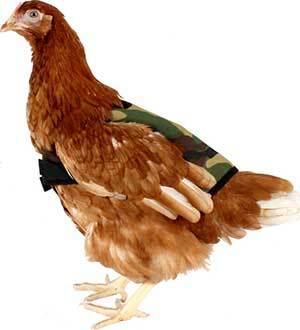 Reversing last year’s stand-out High Vis statement, the perennial military trend hits the coops this season with the launch of Omlet’s Camouflage Chicken Jacket. Whether they’re dolling themselves up for a night out, preparing for battle against an army of henpeckers or forming a disguise to keep badly behaved cockerels at bay, cool chicks, army birds and rowdy hens go mad for a bit of camo. Offering great comfort and protection with a breathable, showerproof fabric outer, the jackets are ideal for keeping your hens warm, dry and clean when doing battle on rough terrain (your garden) as well as giving them serious street cred. Ex-battery hens especially will appreciate this khaki garment to keep their bald bits warm and hidden so the other troops don’t laugh at them. 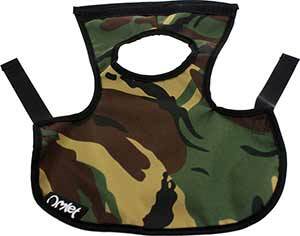 Perfect for medium sized chickens, the adjustable velcro fastening ensure a comfy fit every time. Omlet’s Chicken Camo Jackets are £12, available to order online.